Instead of setting yourself back over 100$ for an authentic German sauerkraut urn, you can ferment in a 5 gallon bucket to make sauerkraut that’s just as good. Sauerkraut at home is just two ingredients – cabbage and salt. But you have to get the right salt, it should say “pickling salt” or “canning salt.” Here’s an example. You will need something to weigh the sauerkraut down as it ferments. You can use the standard sauerkraut stone disks, or something as simple as a plate weighed down with a gallon jug of water. There is some disagreement about whether the orange Home Depot buckets are food safe. If you have access to a bucket that is explicitly labeled as food safe, which Home Depot buckets are not, it’s best to use that. To find out more, read our full dissection of the food safe buckets issue. First make sure your bucket and weight are clean as can be. Soap, hot water, and plenty of scrubbing will get you there. Chop up your cabbages. 2 heads will make about 2 quart jars, so adjust as necessary based on your hunger for the Kraut. Knead in 2 tsp of picking salt per pound of cabbage. Kraut kneading is similar to wringing out a washcloth. The salt will draw moisture out of the chopped cabbage. Don’t waste these juices, you need them for the fermentation process! You should have enough cabbage water to completely submerge your chopped cabbage without adding any extra..
Decant your cabbage with its juices into your bucket. The liquid should just cover the cabbage. To make sure it stays under, submerge the sauerkraut using your plate with a weight on top. If you do need to add water to bring your water level up above the cabbage level, make sure you use water free of chlorine. Almost all tap water contains chlorine, so you will either want to boil it off then let the water cool, or use distilled water from the store. As your sauerkraut ferments, check it every few days. Scrape off any scum you see, but don’t agonize about getting it all off – just get as much as you can. By covering your bucket with cheesecloth, or loosely capping with the lid it came with, you’ll keep insects off and keep most of the smell inside the bucket. Just don’t seal your sauerkraut in, because the CO2 needs to escape. Unless you want carbonated sauerkraut. Sauerkraut morphs in flavor as it ages. Typical time for fermentation is between 4 and 6 weeks. Taste it as it matures to see how its flavors are changing. Some people prefer the taste after just 4 weeks, while some like to wait the full 6. Sauerkraut will last for 4 months in the fridge, and can be hot water canned in mason jars to preserve them even longer and at room temperature. Check with your canning manual to get exact canning times. You can also make a tiny batch of sauerkraut right inside a mason jar. Discover how over on JarSpot.com. Those buckets aren’t food-safe. I wouldn’t even drink water stored in one of those, much less eat something that had fermented inside it for 4 to 6 weeks. That’s true. You should choose a food-safe bucket and the home depot buckets aren’t food safe. A lot of Mexican restaurants get their sour cream in 5 gallon jugs, which I’m sure are food safe. Perhaps it’s worth a try? Home Depot buckets *are* food safe. 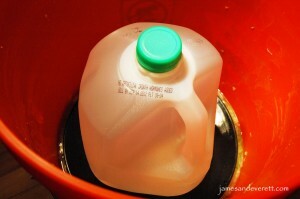 Any container marked HDPE 1 or 2 is food-safe and can safely ferment liquid, provided they are properly sanitized first. Yes Home Depot buckets are fine . I have made tons of sauerkraut in them and it turns out Awesome . A dinner plate covers the kraut perfectly and a 1 gal milk jug filled with water weighs the plate down perfectly . Just wash the buckets before you use them . I found “food grade” buckets at Lowe’s. They are white in color and have the words “food grade” on them. I use them to store flour in for my home baking business. I am going to designate one for making the sauerkraut in. Burger King uses 5 gallon buckets for their pickles. They are already pre seasoned! Nice! I am super excited to make it! Doughnut shops usually have the five gallon buckets for free or for sale cheap. The icing and jelly fillers come in five gallon pails! 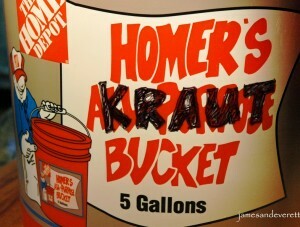 We used the blue #2 lowes bucket last year and made some of the best Kraut I have ever eaten. Bucket cost a couple of dollars ea. We fermented 6-8 weeks. I prefered the 8 week myself. You can use any 5 gallon bucket as long as you use a food safe brining liner. Or go to any fast food business and get their 5 gallon pickle buckets. You say the salt used must be pickling or canning salt, but you don’t say why. Can you elaborate? I ask because I have been using sea salt to make my sauerkraut without any problem. Is it just that you’re trying to eliminate iodine/anti-caking additives? I’ve read that iodine in salt should be avoided. Go to your local grocery store and ask the bakery for empty frosting buckets. Most stores will give you the buckets and lids for free. The gasket from the lid comes off and works great to seal the cloth around the top of the bucket to keep any pests out. I’ve gotten buckets from Walmart and Sam’s Club also. Frosting buckets hold around 4 gallons. You could use 3 or 4 gallon ice cream containers from the local ice cream stand. They give them away. I am sure they would be food safe plastic. I use beer / wine making food safe buckets with a lid and an air lock, just the way you would make wine or beer at home. I run the cabbage through a food processor and add 2 tablespoons of canning salt per 5 pounds of cabbage, just weigh an average head of cabbage to know what 5 pounds looks like. 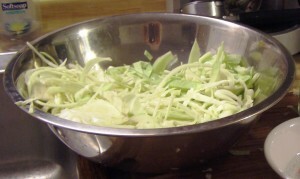 Chop the cabbage, throw it in the bucket, add the two tablespoons of salt, and stomp it with an old fashioned potato masher until the juices come out of the cabbage, repeat the process until your bucket is full, place a dinner plate on top, seal the bucket with a lid, insert the air lock and fill the air lock with water. Six weeks later it’s ready to eat. 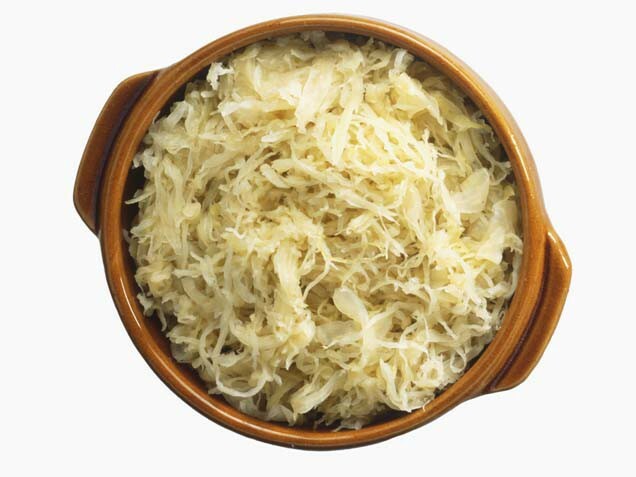 You must ferment the sauerkraut in an air tight container for the anaerobic bacterial action to take place, creating lactic acid. I also add powdered probiotic bacteria such as lactobacillus to ensure quicker fermentation. The faster it ferments, the less chance you will have of spoilage. Nothing beats the taste of homemade sauerkraut canned in Ball Jars to be enjoyed all year long. I’ve tried to make a small batch of sauerkraut twice now and ended up with a lot of mold on top. Someone at a historical festival giving out samples said that was normal, just scoop off the mold. Yuck. I don’t see anyone here mentioning mold. If I keep it totally submerged will that prevent mold from forming? The “Mold” is a yeast colony that forms, just skim it, it’s fine. If you use a trash bag full of water on top, it creates an air-tight seal and weight. You may still get some of the brown kraut- yep, you just scoop it out. 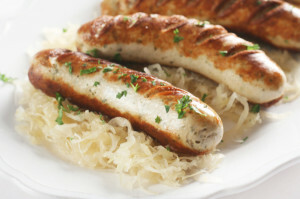 So simply cold-packed and fermented without canning you can expect kraut to last 4 months? That’s great! I don’t know if it’ll last much longer than a couple weeks in my household because of the family, but you never know! Thanks so much for sharing your recipe! Wow, I followed these directions and just sampled my 15 pound batch after 4 weeks fermenting. A squeaky crunchy kraut but I’m letting it go 2 more weeks for a stronger flavor. Get a food-grade bucket from any grocery deli or bakery. They get pickles, frosting, etc. in them and just throw them out. They will clean them out for you, and you can get a lid that fits as well. 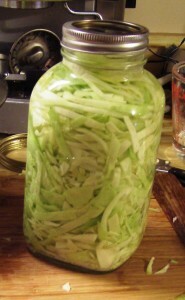 The ratio for 5 gallons is ~3 qts of shredded cabbage, layered c ~ 1/2 C canning/pickling salt, push down. The “water” will happen naturally. Fill a 13 gallon trash bag about 1/4-1/3 full of water, and tie off in a knot. Put this on top of the cabbage and salt – it provides an air-tight seal and weight. Put the lid on, put it in a cold/cool area, and check for flavor in about 4-6 weeks. If it’s not to taste, just let it go longer.